William Cox was a British Colonel and Brigadier General in the Anglo-Portuguese Army. He was selected by Wellington to command the Almeida Fortress. Wellington knew that he was fighting a retreat back to the Line of Torres Vedras, but what he needed was time for those defenses to be completed, and, to avoid a full encounter with Massena's Army. Even a victory over Massena would only reduce the French Army, while his own troops were much more difficult to replace. 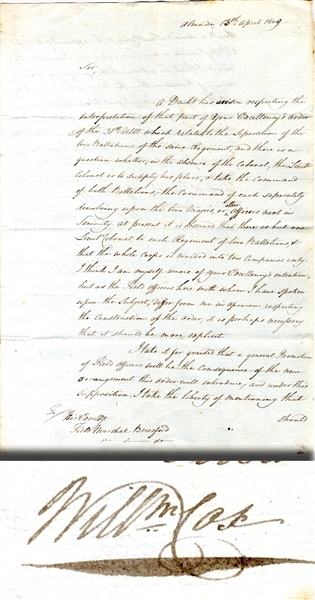 Autograph Letter Signed “”Willm Cox”, April 13, 1809, written to General William Carr Beresford, 2pp., fine. In small part, “A doubt has arisen respecting the interpertation of Youe Excllency’s order ... related to the separation of the two Battalions ... it is perhaps necessary that it should be more explicit ...” and continues with recommendations. Fine. In the event, when Massena began his siege of Almeida, an unlucky, artillery round landed in the main castle keep and ignited a powder trail that led to the main magazine. It initially ignited some 4,000 prepared charges, which in turn ignited 150,000 pounds of black powder and 1,000,000 musket cartridges. The ensuing explosion killed 600 defenders and wounded 300 more. The castle was razed to the ground and sections of the defenses were damaged. Unable to reply to the French cannonade without gunpowder, Cox was forced to capitulate the following day with the survivors of the blast and 100 cannon. The French lost 58 killed and 320 wounded during the operation. It is said that this rivals the worst man-made, non-nuclear explosions ever known. Cox was the brother-in-law of Field Marshal William Carr Beresford, Commander in Chief of the Anglo-Portuguese Army.